It’s that time of the year again when we are busy with shopping, decorating and preparing for family dinners and fun-filled parties. Yesterday we took a look at how we can take the festive joy beyond the front porch and living room and into the modern kitchen. Today we showcase 12 gorgeous dining rooms in red and green that promise to offer the perfect backdrop for an amazing evening of festivities over the next few weeks and beyond. Red and green are obviously two colors that are instantly associated with Christmas. 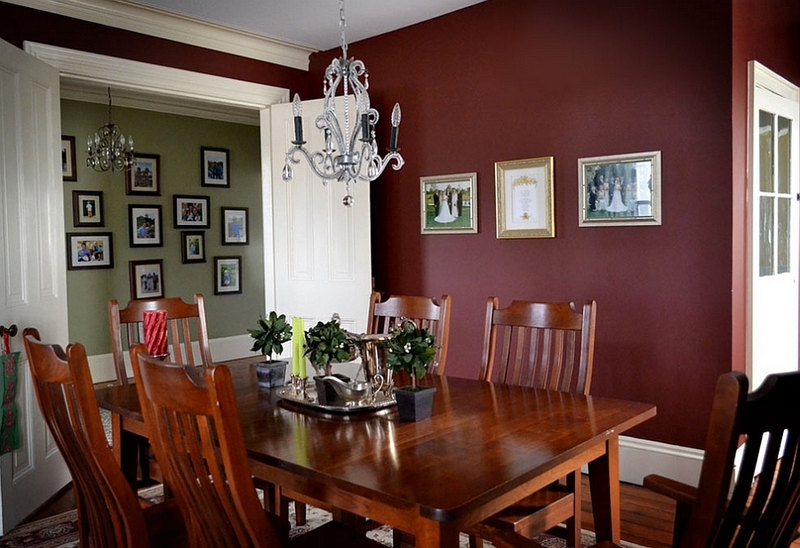 Yet you can pick a dining room with these colors to serve you elegantly all year long! Since both red and green are available in a multitude of hues, the possible combinations can be simply endless. 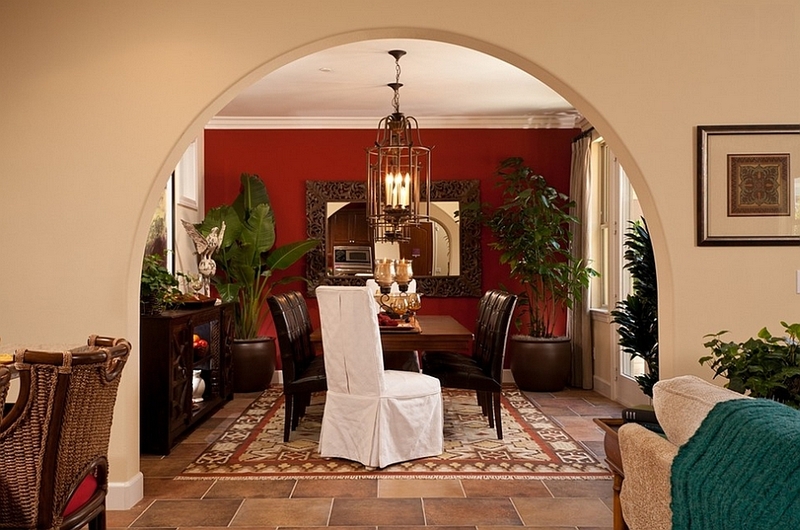 The stylish inspirations on display here today explore everything between dining rooms drenched in these two colors to spaces that only use a neutral backdrop that allows pops of red and green to shine through. And if all else fails, there is always holiday decorations to fall back on! Both red and green are colors that make a big visual impact. Yet they can also double as beautiful neutrals, with one complementing the other elegantly. 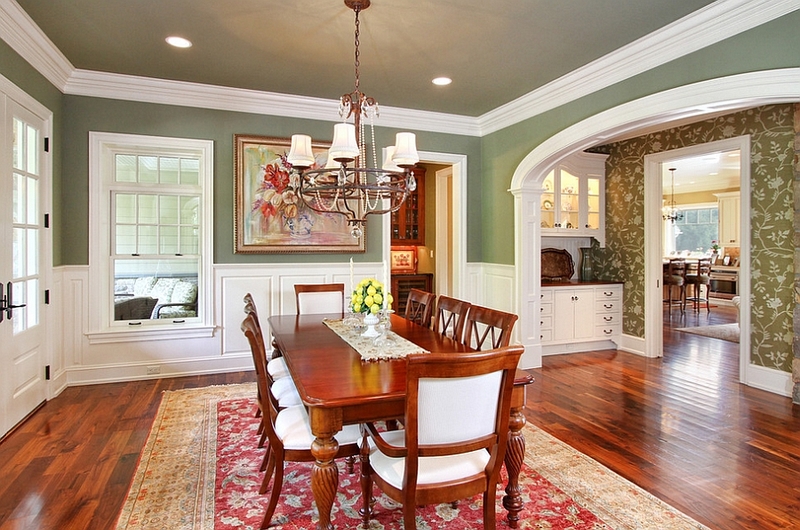 The use of both green and white for the dining room walls here gives the space an airy yet inviting appeal. 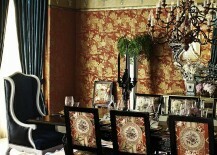 The wallpapered area in the backdrop along with the ceiling in gray gives it an additional layer of intrigue. 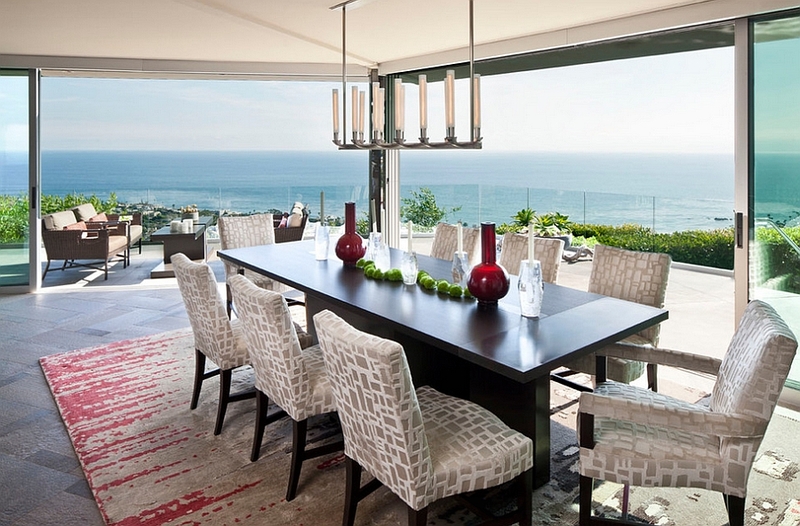 A beautiful rug in red complements the lovely dining table and chairs to create a warm, exquisite dining space. 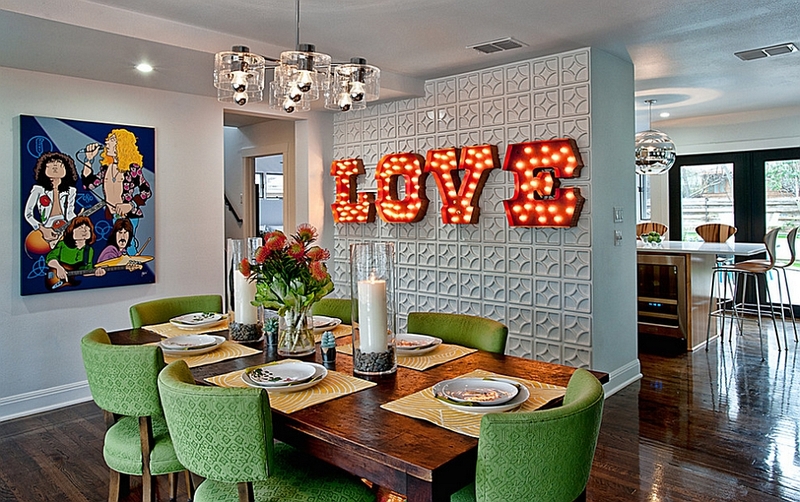 Unique, vibrant and eclectic, this dining room is part of Christina Aguilera’s fashionable LA residence. 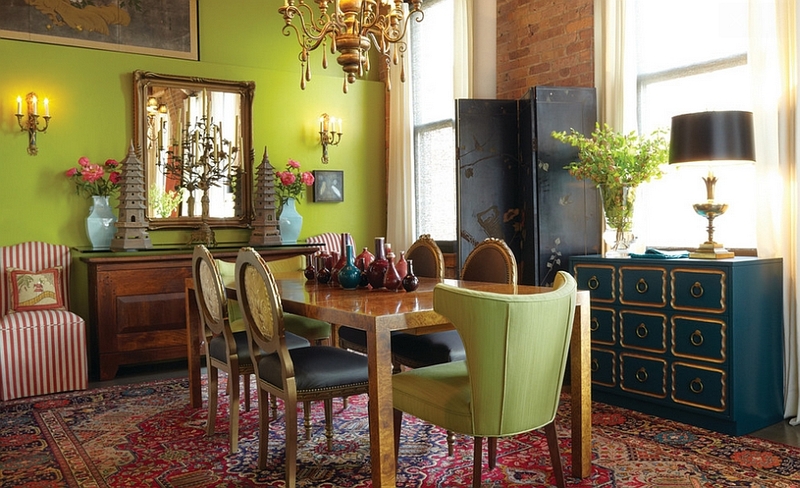 The expansive use of colors along with vintage dining table chairs, Art Deco touches and rich wallpaper ensure that the dining room has an aura of its own. The presence of velvet turquoise and a hint of green along with the intensity of red gives the room an opulent, festive look without any holiday decorations! The first thing we noticed in this room is the chair in the corner with red and white stripes and how well it would go along with candy cane-themed Christmas decorations. 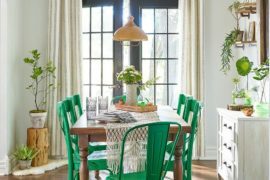 Lime green also adds an interesting, fun twist to the room, and the dining space has a cheerful, snug ambiance. All you need to do here is switch out some of those vases with Christmas ornaments and figurines during the holiday season and things can go back to normal by the first week of January! Simple, understated and practical, this dining space has a lot going for it. 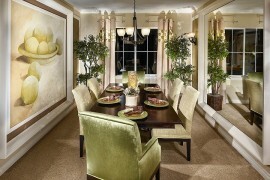 One of the interesting features here is the way in which green is added to the overall appeal of the room. While the walls of the dining area are painted red, it’s the hallway walls that bring green into the room. 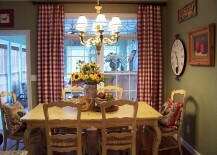 A simple chandelier and traditional dining table and chairs complete the graceful setting. This is probably one of the best French farmhouse style dining spaces that you will ever come across and does seem like a perfect place for family dinner on Christmas Eve! 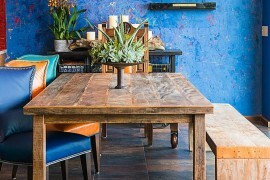 There is something inherently appealing about the style and its rustic undertones that give it a cozy, relaxing feel. 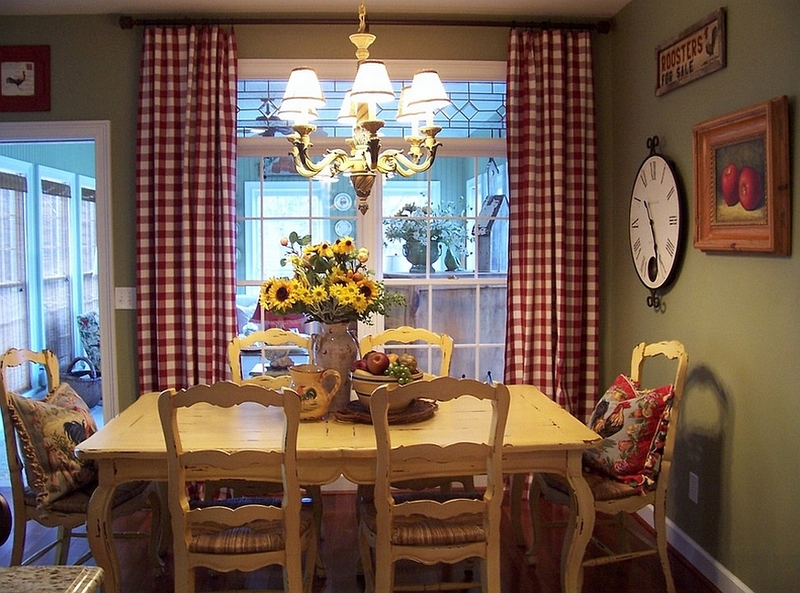 Drapes in red and white checkered fabric and charming green walls bring in the two festive hues, while country-style tables, chairs, decor and accessories enhance the appeal. Picture-perfect indeed! It’s not just decor, paint and accessories that can add color to a room, and this astonishing, industrial-style dining room gets a green tinge with a giant potted plant. 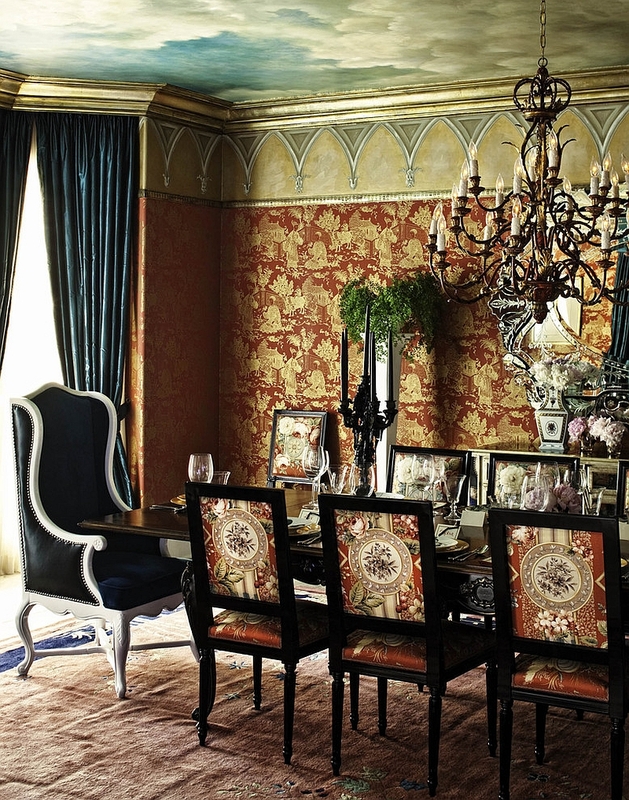 The muted red backdrop, dazzling chandelier and exquisite black additions give it a sophisticated aura. Add a few shiny hand-blown glass ornaments and maybe even more greenery with a small Christmas tree, and you are all set for some magical holidays, industrial-style! We absolutely love how this traditional dining room moves away from conventional design to embrace a more casual, laid-back look. With green benches around the dining table and orange-red walls, you can rest assured that there will never be a dull moment in here. An additional window seat means that you can turn the dining room into a relaxing lounge after a sumptuous dinner as you share stories with friends and family. 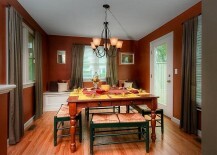 It does seem that the best way to add green to the red dining room is by simply letting nature do its job. If not the best, it sure is the healthiest option of them all! 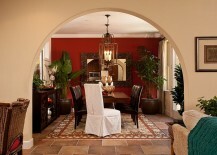 The potted plants bring freshness and even visual symmetry to the room and complement the red accent wall delightfully. A combination of good natural light and artificial illumination further accentuates the look of the room. 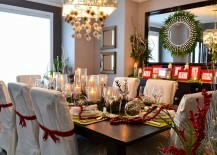 So, maybe you are not too keen on getting stuck with a red and green dining room all year long. We understand your design conundrum. A simple solution is to obviously use holiday decorations and ornaments to usher in these two colors for the next few weeks. While that sounds all too simple, this approach works best when you have a dining room with a neutral backdrop and colors that do not clash with red and green. If the dining room above is for those who prefer a contemporary, holiday-centric design, this one is for those among us who still would like to stick to tradition during holiday time. The marvelous and expansive room is filled with intricately carved wooden surfaces that are beautifully highlighted using sconce lighting. 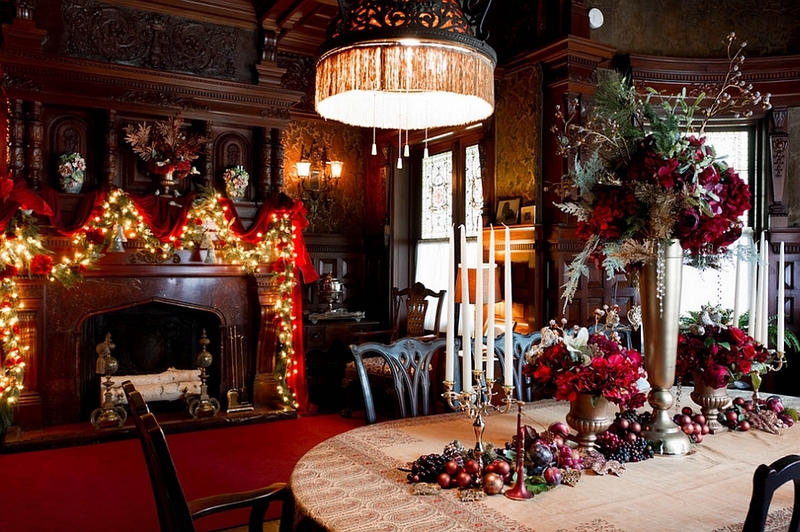 The Christmas fireplace mantel becomes the focal point here, even as the red carpet adds a sense of magnificence. 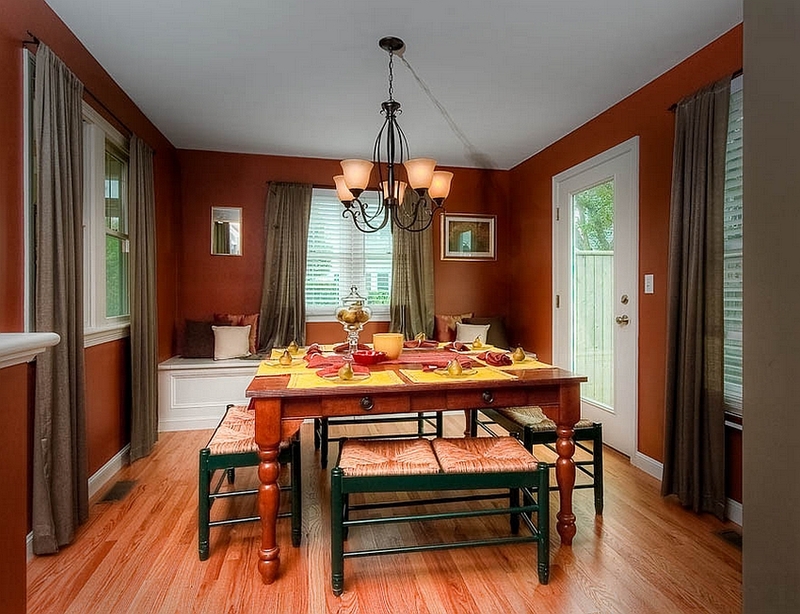 I know you are thinking, “This is not a red and green dining room,” and that is precisely the point. 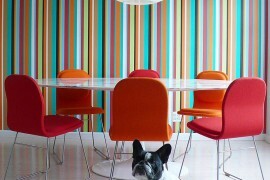 Here is a perfect example of how to use the colors in a restrained yet smart manner to make a visual impact. 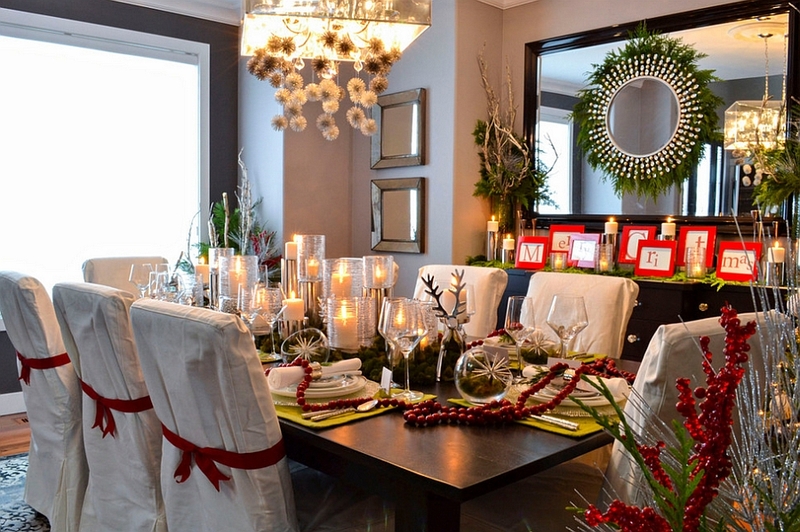 Just imagine adding some Christmas decorations to the room and maybe a few more of those bold red vases, and you have a dining space that is ready for the holidays. 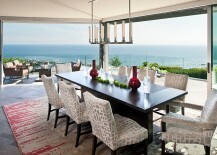 And once the dust settles, you can easily switch back to your posh dining room with stunning ocean views.